Assistant Director of Operations, Robin Brisco, and GED Tutor Volunteer, Chris Colby, are two of the forty people gathered at our full day strategic planning session. How do people make decisions? How do they chart a course of action, grapple with the big question about why am I here? What is my purpose? I have had a lifelong rhythm of reflecting on these questions as I see what I call a zero-birthday on the horizon. At 20 it was “what am I going to do with my life?”, at 30 it was contemplation about career and family, at 40 it was another round of reflections on career through the lens of my growing clarity of purpose, and at 50 (yes, 50!) it was about going after a seemingly impossible long time goal of a master’s degree. In my personal life, I found this kind of personal strategic planning to be a great way to correct course, take stock of past learning and growth and figure out what I needed to do next. My planning led me to move to a new city, change careers, leave a failing relationship and earn that master’s degree. Since I started at Literacy Services I have been thinking about how effective organizations make decisions. I focused on learning about how successful institutions make and implement strategies and plans. I asked myself, what is our purpose here at Literacy Services? Are we meeting the needs of the community? 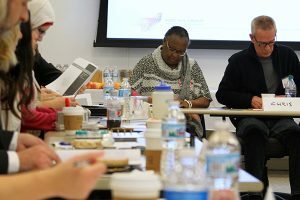 Teams of Literacy Services’ board of directors, volunteers, and staff worked together to share their different perspectives and hone the vision of our agency during our strategic planning retreat. 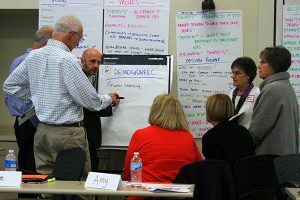 This summer the board formed a Strategic Planning Task Force to guide the planning process. Board Member Robert Lawton volunteered to serve as the chair of this task force and to recruit members to it. He assembled an amazing group! He asked our current board president and our three recent past board presidents to serve and they all agreed. Mary Tobin, David Hanson, Kim Metcalf-Kupres, and Mark Short were joined by respected former LSW Executive Director and experienced nonprofit leader, Mar MacLeod Brahm, to round out a group of knowledgeable leaders. I also serve on this task force. In no time, this group proposed a process and a consultant team to the board of directors for their approval. The board voted to move forward and off we went! On November 16 we met at Manpower’s world headquarters and filled a beautiful meeting room with 40 people representing the board, volunteers, and staff (Thanks again to Board Member Grace LoCoco!). We pounded through an aggressive agenda based on the book The Nonprofit Strategy Revolution by David La Piana. We spent 8 hours together under the guidance of our consultant team of Dennis Johnson and Ben Williams, from the Madison-based Sort Sol Group. As I write you now, we are still knee deep in refining the ideas, draft strategies, purpose statement, and many other critical pieces of what will become Literacy Services’ strategic plan. It is not yet clear how the final plan will take shape, but one thing is clear. Eleven board members, 14 volunteer tutors, and 13 staff members are so committed and passionate about this mission, this organization and our students that they dedicated a full day out of their busy lives to contribute what they know, what they feel and want for this organization. It left us exhausted, more connected and knowledgeable. The buzz created by this group was nothing short of exhilarating! It left me feeling “filled up” by what I can best describe as “the goodness” in that room. I felt energized with confidence that Literacy Services will be ready to jump to the next level, successfully tackle some of the toughest issues our community faces, and celebrate many more zero birthdays to come. We look forward to sharing the results of this process with our community. Stay tuned for updates in the New Year! In the meantime, if you have an idea, a concern or encouragement you would like to share, write me at ginger@literacyservices.org. We need your support too, now more than ever! Please consider making a donation before the year ends! I promise your hard earned dollars will be wisely put to good use to reach more adults, change more lives, and put hopes and dreams into action.